FX DailyRange is a highly effective indicator that shows you the predicted high and low for the day. It gives you an intraday support and resistance range, and it’s very different from other indicators that simply show you the high and low of the previous day. The pricing mentioned in the video above was only valid during the initial launch. FX DailyRange predicts the high and low of the coming day for the 20 major forex pairs, and allows you to get a sense of where the market is heading ahead of time, which is a great help, regardless of your trading strategy. Knowing in advance where the market will likely reverse or strenghten can make a big difference in your trading. Below is an H1 chart showing a red trendline for the daily high, and a green trendline for the daily low. If you are trading the trend, the market often reverses or changes the trend completely when it hits the high or low. If you are trading counter-trend, look for sell setups around the high, and buy setups around the low. Some of the best trade setups occur, when the market is close to the high or low, when the London session opens with no news announcements. There are no guarantees that the high or low will hold, however it does hold very often. There are exceptions, such as big news announcements. 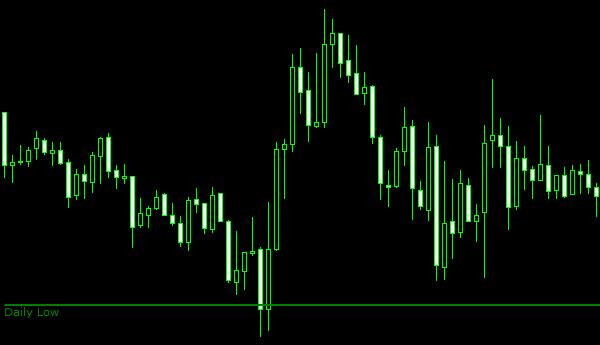 When the high or low is breached by 15 pips or more, the market often retraces to the high or low to test it. When it closes within the range the market very often pulls back. Below is an M15 chart showing how the market reaches the predicted low and pulls back. We recommend using FX DailyRange with other indicators, for example: RSI, Stochastic and TDI. Basically any indicator that can show you over-sold, over-bought and divergence, and also candle-stick reversal patterns such as a Doji, Hammer, Inverted Hammer, Shooting Star and Morning Star. The best timeframes to use are the 5-minute, 15-minute, half-hour and hourly charts. We recommend the 15-minute chart. 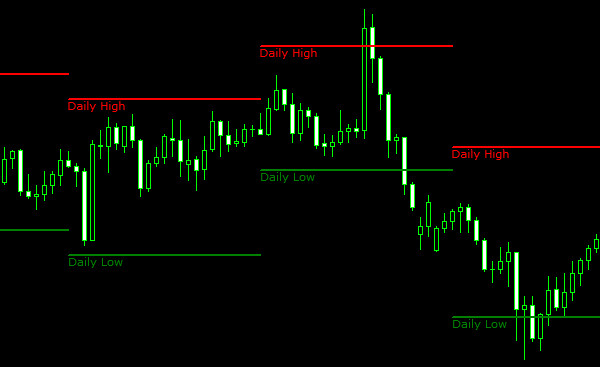 FX DailyRange comes with an application named Indicator Manager. It allows you to easily install and configure the indicator for all your platforms. It also receives the daily high and low from our servers and updates the indicator automatically. 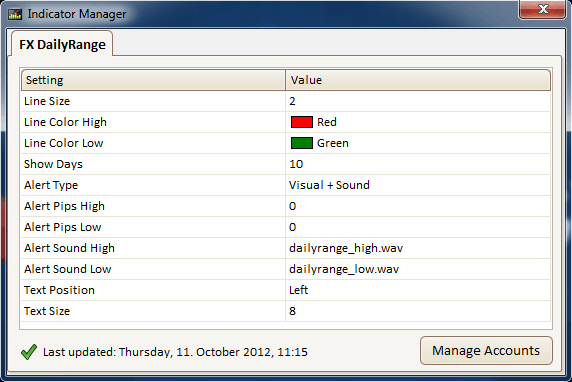 Below is a screenshot of Indicator Manager. 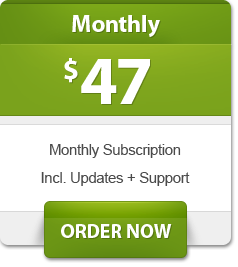 FX DailyRange can be purchased either as a monthly or yearly subscription, both includes all 20 forex pairs. The yearly subscription gets you 2 months for free. 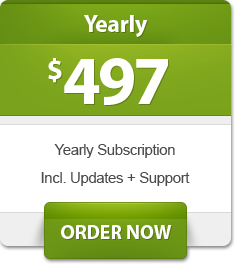 The monthly is $47 per month, and the yearly is $497 per year. Cancel anytime. This product is licensed per machine. We do not offer a trial version. The forex pairs available are: AUDJPY, AUDUSD, EURCAD, EURCHF, EURGBP, EURJPY, EURUSD, GBPCHF, GBPJPY, GBPUSD, NZDUSD, USDCAD, USDCHF, USDJPY, AUDCAD, AUDNZD, GBPCAD, CADJPY, EURAUD and CHFJPY. Trading in the Forex market is very speculative in nature, involves considerable risk and is not appropriate for all investors. You must be aware of the risks and be willing to accept them in order to trade in the Forex market. Therefore, before deciding to participate in Forex trading, you should carefully consider your investment objectives, level of experience and risk appetite. Most importantly, investors should only use risk capital when trading the Forex market because there is always the risk of substantial loss. Do not trade with money you cannot afford to lose. No representation is being made that any account will or is likely to achieve profits or losses similar to those discussed on this web site. The past performance of any trading system or methodology is not necessarily indicative of future results.